Nο: 99, MARCO MATROSO – Illustrator. Nο: 98, BIG BOY – Artist. Nο: 97, JESSICA SOUEIDI – Visual Artist. Nο: 96, SALLY FREUD – Producer, Writer, Sportsfan. Nο: 95, AN WI – Illustrator & Graphic Designer. Nο: 94, NINA – Dreamy girl. Nο: 93, LAPINUS – Artist. Nο: 92, RAMI KASHOU – Fashion designer. Nο: 90, ERA ENESI VENTO – Artist, Photographer. Nο: 89, BRIAN GASTON – Student, Artist, Creative thinker, Dreamer. Nο: 87, AMI CARMINE – Singer, Songwriter, Producer, DJ and Model. Nο: 86, TAWNY ANDERSEN – Art Theorist. Nο: 85, ESRA RØISE – Illustrator. Nο: 84, CHIMA LYONS – Kaleidoscopic, Creator. Nο: 83, JOHN-LOUIS – Creative man, Handy man. Nο: 82, TATIASIAN – Artist, Designer, Model, World Traveler. Nο: 80, JEAN NASCIMENTO – Student. Nο: 79, HORSE KID – Flower Nymph. Nο: 78, LEXIE – Model & Student. Nο: 77, MERCATACORN – Gamer. Nο: 76, MASTER MALICE – Rapper, Emcee. Nο: 75, MADONNA – Singer, Songwriter, Actress, businesswoman. Nο: 74, EVA GURARI – Musician, Photographer & Beautymaker. Nο: 73, SEBASTIAN SOTOMILLAR – Entrepreneur & Creative Director. Nο: 72, ALEJANDRA MANCIA – Social Media Enthusiast & Blogger. Nο: 71, ILYA KHMELNITSKIY – Model & Sound Man. 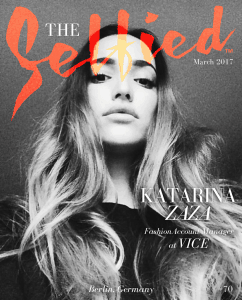 Nο: 70, KATARINA ZAZA – Fashion account manager, VICE. Nο: 69, JayEL – Creative lecturer, illustrator & gamer. Nο: 68, LOEJJIE – Student + Shapeshifter. 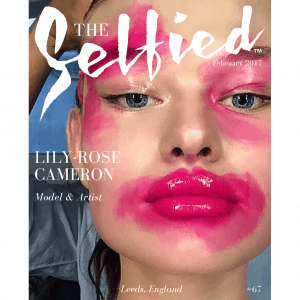 Nο: 67, LILY-ROSE CAMERON – Model & Artist. Nο: 65, ALLA – Self-Art Blogger. Nο: 64, DESTINY OWUSU – OHWAWA – Model & Melanin Influencer. Nο: 63, LUCIANO PARISI – Creative Director & Cool Hunter. Nο: 62, ASHLEE ANNE – Model, Actress & Movement Enthusiast. Nο: 61, ANDY WARHOL – Artist (unauthorised). Nο: 60, JULIETTE – Animation student. Nο: 59, GIANNINA OTETO – Kenyan Refugee turned Model. 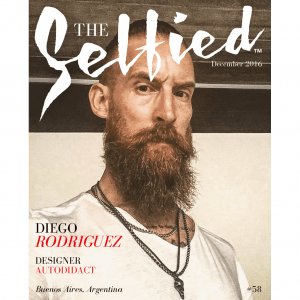 Nο: 58, DIEGO RODRIGUEZ – Designer, Autodidact. Nο: 57, ANGELA BILINSKA – Illustrator & Handpoke Tattooist. Nο: 56, KATE SVYNARCHUK – Model from Ukraine’s Next Top Model. Nο: 55, DJ LAUREANO – DJ & Sound Engineer. Harlem. Nο: 54, MEL BRADY – Creative Stylist, Model & Writer. Nο: 53, BUNNY SUMMERS – Musician. Nο: 52, VESA PERAKYLA – Fashion Stylist & Creative Director. Nο: 51, KATE JAGGARD WILLING – Model & Actress. Nο: 50, JAIME TRAVEZAN – Image Maker. Nο: 49, @GLOOMY DAWN – Instagrammer. Nο: 48, ANA BONAMICO – Artist. Nο: 47, SHANE EDMONDS – Personal Trainer. Nο: 46, HALLOWEEN ISSUE – International. Nο:45, RENO OKIC – Optician. Nο: 44, IDA WALLENTIN – Exploring Life. Nο: 43, LOCO NINJA – Out, Hip-Hop/Rap Artist. Nο: 42, SASS STILEMAN – Singer, Songwriter. Nο: 40, MILEY CYRUS – Singer, Songwriter & Actress. Nο: 39, JASMINE TAMPOSI – Singer, Songwriter. Nο: 38, DAVID JAMES – Admin. Nο: 37, BRITT KLINE – Fashion Model. Nο: 36, JASON LAUDAT – Architect. Nο: 35, VALENTINA FERRERO – Instagrammer. Nο: 34, VERONIKA ORLOVA – Photographer. Nο: 33, CAT – Goddess, Dreamer. Nο: 32, SARA TANSY – Photographer. Nο: 31, PETER ROSETZKY – Photographer, Art Director & Creator of The Selfied. Nο: 30, KARINA NIKOLE – Artist. Nο: 29, GWYNNE FURCHES – One half of the Furches Twins. Nο: 28, ALBERTO DEGA – Businessman. Nο: 27, MANNY ROMAN – Photographer. Nο: 26, VALERIA SHERRIE – Model. Nο: 25, NOAH SKWIGELF – Professional Pretty Boy. Nο: 24, POLUSLADKOYE – Instagrammer (unauthorised). Nο: 23, TERATOLOGY – An Unconventional Designer. Nο: 22, KATARINA PAVLOVIC – Journalist & TV Presenter. Nο: 21, MISTY FOX – Beauty Expert. Nο: 20, LINDSAY LOHAN – Actress, Model, Singer, Songwriter. Producer. Nο: 19, @RIDICULECONTENT – Instagrammer. Nο: 18, CLAUDIA – Fashionista. Nο: 17, NEUTRAL FLEUR – Instagrammer & Socialmedialite. Nο: 16, VINCENT VAN GOGH – Artist. Nο: 15, REYGAN – Artist, Clown, Ghost Girl. Nο: 14, GREGG BROCKINGTON – Fashion & Celebrity Makeup Artist. Nο: 13, INGLET VON SINGLET – Artist & Designer. Nο: 12, NILOUFAR – Golden Girl. Nο: 11, KIDFLAV RRIKÉ – The French Rapper. 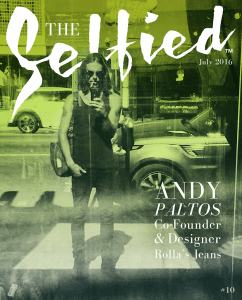 Nο: 10, ANDY PALTOS – Co-Founder & Designer, Rolla’s Jeans. Nο: 9, NAN YEONG – Beat Boxer. Nο: 8, EMMA – Queen of Self. Nο: 7, MONA – Criminal Justice Major. Nο: 6, CHAMSWAG – Artist & Rapper. Nο: 5, ALBERTO GUZMAN – Fashion Hairdresser. Nο: 4, LAURA – Fashionista. Nο: 3, LABRINI KIANIDIS – Creative Producer. Nο: 2, ANTHONY CAPON – Fashion Designer. Nο: 1, RACHEL PERRIN – Artist.